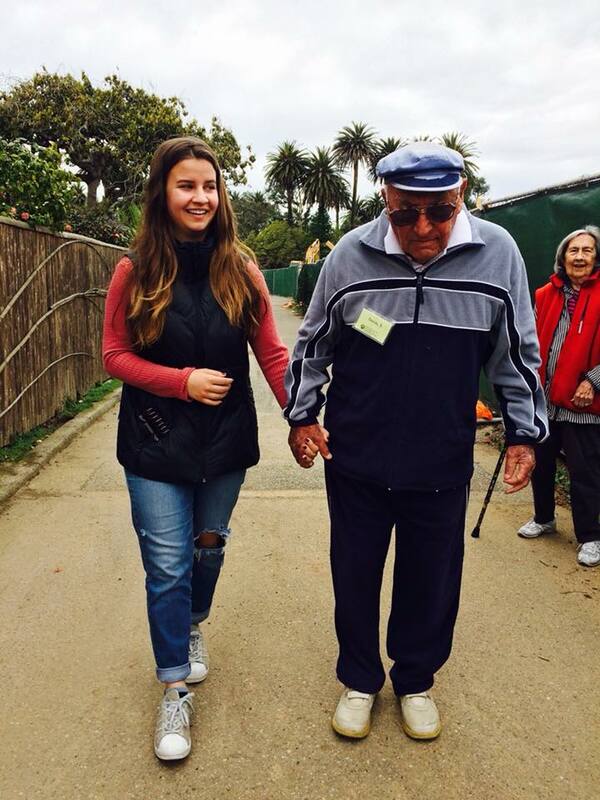 Today’s blog post, celebrating National Volunteer Month, comes from Montecito Program Manager, Kathryn Cherkas, MIPH. People often ask me about volunteer opportunities at Friendship Center, quickly following with ‘But I don’t play an instrument’ or ‘I might be too shy’. What I say to them, and want to stress to everyone reading this: Do you have a kind heart that beats? If so, you have what it takes to be a volunteer! To demonstrate this point, I would like to highlight a very special volunteer. Jane* is a 12-year-old girl who first came to Friendship Center Montecito with her class during a school-wide day of service, visiting with our community’s “gradmas and grandpas.” Jane immediately warmed to the members and spent time with Victor*, one of our participants with more advanced dementia. Jane returns regularly to visit with the seniors for about thirty minutes after school, talking about everything from what she is learning in her studies to the new rubber bands on her braces. Victor, who normally struggles to form coherent sentences, brightens and is more communicative whenever she is here. The impact of Jane’s visits is palpable–you can feel the joy radiating from each of the members. Here are some specific volunteer opportunities at Friendship Center. If you have something else you would like to share with our members, fabulous! Reach out, we’d love to talk about it. Leading our new BrainFit class, fun memory exercises for seniors! We require all volunteers to have a clean bill of health, no criminal record, and a willingness to learn about dementia and related disorders. This entry was posted on April 1, 2019 at 11:00 am and is filed under Business, Cultural, Education, Family, Health, Local, News, Seniors. You can follow any responses to this entry through the RSS 2.0 feed.